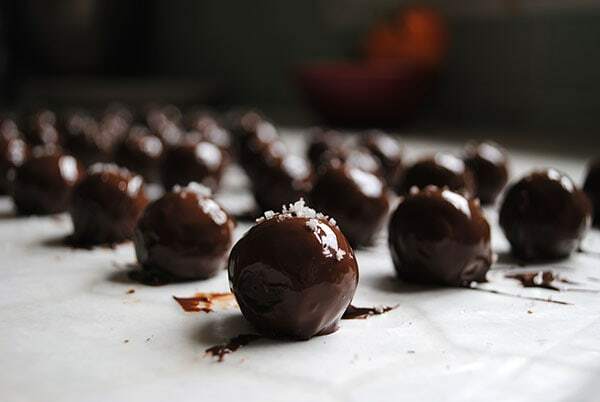 These Dark Chocolate Truffles with Sea Salt have a chocolate caramel ganache center, are enrobed in a layer of dark chocolate, then topped with flaky sea salt. They’re a great gift — whether that gift is for yourself or someone else! 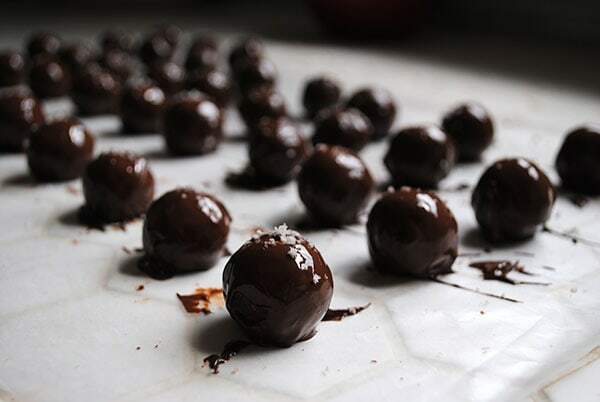 About ten years after I tried my first truffle, I set up a little baking company of my own and sold these Dark Chocolate Truffles with Sea Salt. The company no longer exists, but I wanted to share the chocolate truffle recipe with you so you can still enjoy them! They make great gifts and I found they’re good for two to three weeks. Just don’t put the chocolate truffles in the fridge, because that will cause chocolate bloom. It doesn’t effect the flavor, but doesn’t look super appetizing either. Looking for more chocolate recipes? Try these Chocolate Crinkle Cookies! Then, temper your chocolate and dip the truffles into the tempered chocolate. Retrieve using a standard fork or, if you have it, a chocolate dipping fork and place on a parchment-lined baking sheet. Let cool for 1-2 minutes, then top with flaky sea salt, like Maldon. Store in an airtight container at room temperature for two to three weeks. For this recipe, I’m consulting my old notes/the original post from seven years ago and, apparently, the first time I made the caramel for the chocolate truffles, I destroyed it by letting the cream curdle. With the help of this video from Fine Cooking that illustrates the different caramel stages and what to do and not to do (you know, like curdle the dairy), I got the hang of it. If you’re a visual learner at all, I highly recommend giving it a watch before making the chocolate truffle recipe. What Chocolate is Best for Chocolate Truffles? When I’m working with chocolate, my go to is Callebaut. (This isn’t a sponsored post. I just have always really liked Callebaut.) I like Valhrona too, but I find it a little bitter for straight chocolate desserts, like these chocolate truffles. You can buy it as a block, but that does make it harder to work with. Or, you can buy it as callets (essentially these flattened chocolate chips) and that will make things infinitely easier. If you like making chocolate, I recommend buying it in bulk as it will save you money in the long run. These days, when I’m buying chocolate, I usually get this five-pound bag. The trickiest part of this chocolate truffle recipe is tempering the chocolate. You need to temper the chocolate for the outside of the truffles because that’s what creates the firm shell around the ganache center. Without it, the chocolates will soften quickly at room temperature. I need to create a whole post about how to temper chocolate, but the basics are thus: To temper chocolate, you melt the chocolate to a certain temperature, drop it to a certain temperature, then warm it back up to a certain “working” temperature. I’m being vague because the temperatures are specific to the type of chocolate you’re working with and will vary depending on whether you’re working with milk or dark chocolate. The ideal temperatures also vary by brand, but less so. This tempering method is just one of many ways to temper chocolate. It’s not necessarily “the best” but it’s my go to. First, weigh the amount of chocolate you want to use in grams. (Don’t have a kitchen scale? This inexpensive one is my go to.) Then, measure out 1% of that in Mycryo cocoa butter crystals and set that aside for later. For example, if you’re using 300g of chocolate, use 3g of Mycryo. Melt the chocolate using a double boiler approach. Fill a small saucepan with water, and place a metal bowl filled with the chocolate on top and let it melt on medium, stirring and checking the temperature until it’s 104°-113°F. With an oven mitt, remove the bowl from the heat and place it on your working surface. Let it cool to 93.2°-95°F. Add the Mycryo and begin to work with the chocolate when it’s between 87.8°-89.6°F. Depending on how quickly I’m dipping the truffles, the chocolate will get too cool and stiff and then I’ll have to warm it up again. To do this, I use the Wagner HT1000 heat gun. Is it overkill? Probably. Is it fun? Yes. It also heats the mixture quickly and is less of a pain then running back and forth to the stove. Also, it reduces the chances I’ll get water on the chocolate (see side note two). Just be careful because it does really heat it quickly and you don’t want to heat the chocolate too much. To check if your chocolate is tempered, drizzle a little on a piece of parchment and let it be for about five minutes. After five minutes, does it look shiny? Does it have a nice “snap” if you pick it up and crack it in half? If it folds gently or doesn’t have a shine, it’s not tempered correctly and you’ll need to start over. Put the chocolate back into the bowl, measure out more Mycryo, and melt the chocolate down again. These temperatures are to be used if you are using cocoa butter to temper chocolate. 1. Melt to 104°-113°F (40°-45°C). 2. Cool to 93.2°-95°F (34°-35°C). Add cocoa butter. Side note: When I’m tempering, I don’t use a candy thermometer. I use an infrared thermometer gun to check the temperature. It gives me an instant read and has the nice side effect of looking kind of badass. Side note two: Don’t let any water touch the chocolate because one drop will ruin all of your chocolate. I like to think of it this way: chocolate is allergic to water and it will have an unpleasant reaction if it comes into contact with it. Side note three (heyo! ): If you’re totally intimidated by tempering, it’s ok to just roll the chocolate truffles in cocoa powder and enjoy them that way! 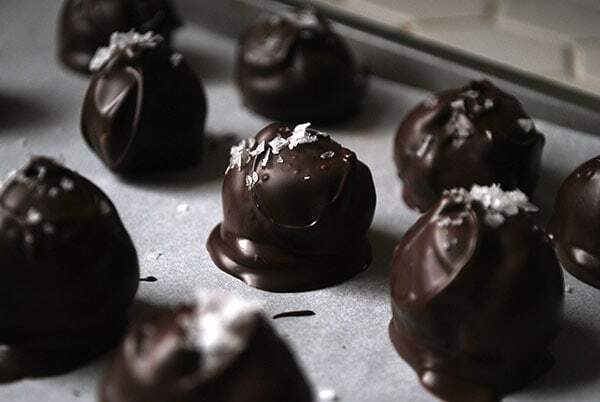 These chocolate truffles are mixed with rich caramel, enrobed in dark chocolate, and topped with flaky sea salt. Place 8 ounces of chocolate in microwave-safe bowl and place in microwave. Add sugar and water to small saucepan. Stir to combine. Turn the heat to medium. Do not continue to stir. Melt the chocolate. Microwave for one minute at 50% power, then stir. Microwave for 30 seconds at 50%, then stir. Repeat until chocolate is fully melted. Let caramel cook, without stirring, until mixture is a dark amber color. Add heavy cream to the caramel mixture and begin to stir immediately and vigorously until fully combined. Remove from heat. Pour caramel mixture into chocolate mixture and add optional fleur de sel. Stir to combine. Place plastic wrap on top of mixture and put in refrigerator until mixture has fully cooled (about 3 hours). Remove chocolate caramel ganache from refrigerator and scoop into 35-40 truffles using melon baller or size 50 disher. 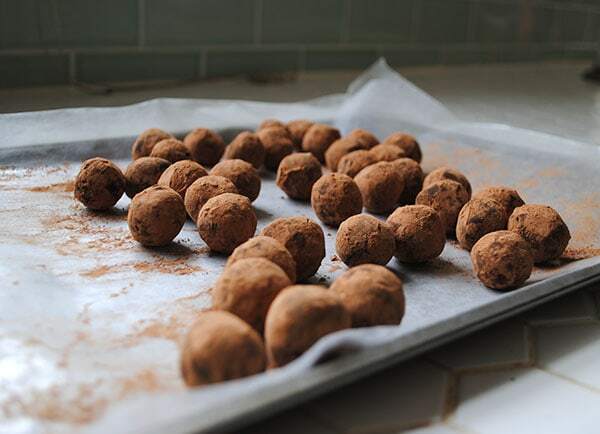 Roll each truffle in cocoa powder and set on parchment-lined baking sheet. Place sheet in refrigerator. Dip prepared truffles into tempered chocolate using fork and place on parchment-lined baking sheet. 1 to 2 minutes after dipping, sprinkle flaky sea salt on top. Store at room temperature in airtight container for two to three weeks. Becca, they look so delicious. Can’t await the upcoming weekend where I make myself a batch of those! GIMME ALL OF THESE. Seriously, these look absolutely perfect. Must. Try. I simply love dark chocolate, caramel, and sea salt. Further, I can attest to these truffles and their deliciousness from 10 years ago. Today, she’s taken that recipe to a whole new level. They have the right center and the right consistency and then luxuriously melt in your mouth. In fact, I am getting requests to make my own batch after sharing this recipe. There is no mention of the cocoa butter in the making of the recipe…or did I miss it? Thank you for letting us know – it’s been added. What is the purpose of the cocoa butter in the tempered chocolate? I thought when you temper chocolate you melt it, cool it & re-warm it again. Do you not need to rewarm it if using cocoa butter? Cici – you are correct! When tempering chocolate generally, you do have to rewarm it. With the cocoa butter method, you don’t have to rewarm it to keep it in temper. However… you may have to rewarm the chocolate a bit to keep it workable depending on how long it takes to dip all the truffles.